I thought I'd share some Sunday morning cuteness with you that's totally non horse related. It's not just horses we have on the farm, we have an assortment of chickens, ducks, dogs and geese as well. Its spring,and babies are on the mind of all the animals. Mother goose has been sitting in her eggs for the last three weeks, high up on the hill and tucked away under a thorn bush. 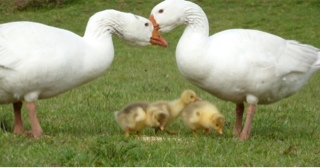 Geese for those who don't know them, are some of the most loyal and family orientated animals I've ever come across. Every day her menfolk, the ganders, make the trek up the hill to check on her and sit alongside, sharing the vigil and waiting for the babies to arrive so they can take on there protective duties. 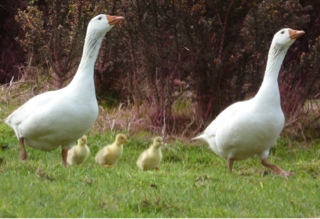 You can always tell when goslings hatch because the whole flock goes up to welcome them into the world. This year something went wrong, mother goose didn't leave the nest. The gosling hatched and were walking around, but mum continued to sit on egg shells. 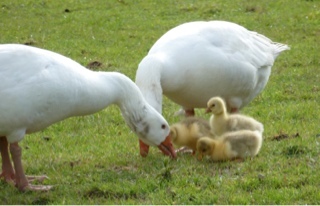 Two days went past, the geese all came to welcome the babies, but mum still wouldn't budge. Then something incredible happened,two males paired up together, and took the goslings. For a week now they have been raising them just as a normal pair would, except instead of mother and father we have dad and daddy gander. It's been a week, and the gay gander dads,are doing terrific, they fuss and fluff over their babies constantly. Finding the newest shoots of grass to graze on, and safest puddles for the babies to paddle in.They take turns chasing off threats and letting the gosling sit underneath them, just as the babies would a goose mother. If any teenager was annoyed about overprotective parents, they have never met these two geese.No other animal including other geese, can get within 20ft of the babies,( im not allowed within 50ft as they obviously remember me stealing there children last year and selling them) without a dad flying at you in a fury of beaks, honking and feathers. Over the years I have never seen such devoted and caring parents as these to. It's inspiring, they love these three little babies, and would without a doubt do anything to protect them. It truly is inspiring to see these boys work together to, not just mother goose's mate, but two boys working as a team, equally devoted to bringing up the kids. Gay rights are always on the news and always controversial, but isn't it inspiring to see something so completely unique and innocent like this happening without any human interference at all. Who's to say it isn't natural, if it isn't hurting anyone, why worry,is my philosophy.